From the sleek, interior design to the time spent exploring new destinations, Viking delivers an unrivalled experience at a truly great value price on board the world’s most beautiful ocean ships. Just imagine an effortlessly cool boutique hotel with Scandinavian inspired interiors and the best views in the world. A stylish collection of bars and restaurants, each one offering a different ambience and culinary experience, and more opportunities to dine al fresco than on any other ship of a similar size. A state-of-the-art, award-winning Nordic spa, providing sanctuary for body and soul. Great nights out at the theatre and the nightclub, and cosy nights in with the latest movies and free room service. Somewhere to be sociable, and somewhere to be alone. 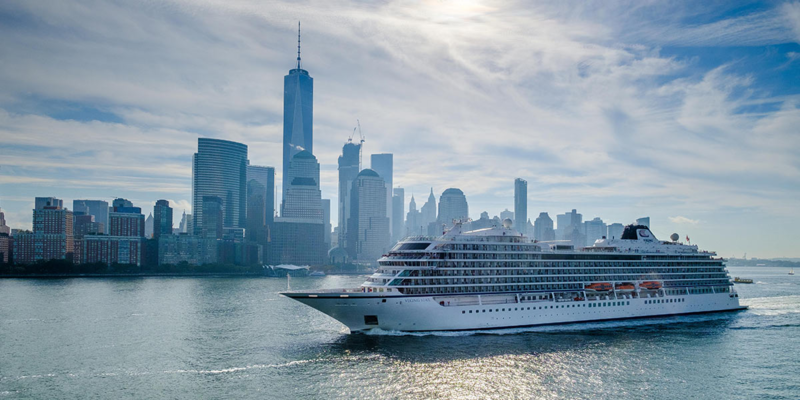 It’s all about your comfort with Viking Cruises. And it’s included in the price. From your spacious veranda stateroom with 24-hour room service on tap, to all meals and snacks on board, including daily afternoon tea in the wonderful, light and airy Wintergarden, you don’t have to pay a penny more. Wine, beer and soft drinks are complimentary with lunch and dinner and you can help yourself to speciality teas and coffees any time you like. Other main inclusions are a guided excursion in almost every port you visit, complimentary Wi-Fi, free use of the spa, a host of activities, performances and demonstrations by day and live music, theatre or cinema by night. In fact, just about everything you need to have a fantastic time, without having to worry about budgeting while you’re away. For small ships, Viking are big on accommodation. Larger than average staterooms each have a king-size bed and a spacious private veranda with table and chairs where you can chill out in private. So whether you choose a standard stateroom or an Explorer Suite, you won’t just have a room with a view, but your own place to sit and admire it, too. Another great way to relax is to head to the spa, one of the many outstanding features that is included in the cost of your cruise. Nothing short of extraordinary, the LivNordic spa on board is a destination in its own right. Somewhere to soothe mind, body and soul, and experience the rejuvenating powers of the traditional Nordic bathing ritual. From the heat of the steam room and sauna to the gentle warmth of the healing hydroptherapy pool and heated stone beds, your body temperature is raised before plunging into a refreshing pool, or tiptoeing into an icy snow grotto. Indulge in an expertly-executed massage, or an holistic facial; the menu of treatments is mouth-watering. And relish the convenience of an on board hair and beauty salon to keep you looking as good as you feel. No matter how many amazing things you see or do on your travels in some of the world’s most spectacular destinations, your Viking ship is the one place you will look forward to returning to again and again.